Answer to Riddle #85: Garden Path. 85. 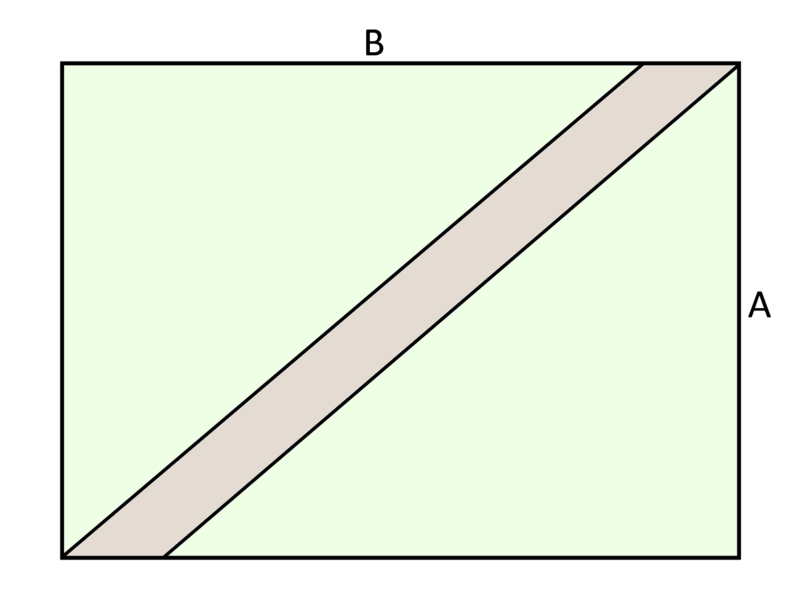 A man has a rectangular garden, 55m ('B' in the diagram,) by 40m('A',) and he makes a diagonal path, 1m wide, exactly in the manner indicated in the diagram. What is the area of the path? We are going to use two relationships to solve for the area of the path: Pythagerous on the triangle (A,B-z,L+y), and that the area of the path + the area of the grass is equal to the total area (A•B). The area of the path is given by (L+y)•x, if that's not clear then it should be from the following diagram, where we imagine a triangle removed from the bottom left to the top right, showing that it forms a rectangle.